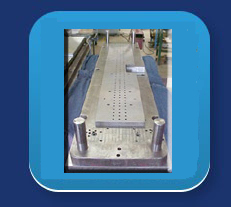 Whether your project involves metal fabrication or plastics machining, ABC Tool & Die is a full service, single source shop, specializing in design, custom design, prototyping, and short run production machining; we work on your job - tools, parts, molds, and dies from conception through the fabrication process. Your job is inspected using state-of-the-art equipment throughout to assure you a quality product. At ABC Tool & Die, our creative, innovative design team takes your initial ideas, plans, or specs, for mold design, injection molding, tooling, and custom, precision machining. Prototyping and short run production machining, build, repair, maintenance, and sharpening your compound dies, or progressive dies.. You can expect precision quality control at ABC - from design and design through machining and fabrication.